UMass sits as the number one ranked team in the country for the first time in school history as the Minutemen prepare to take on #8 Quinnipiac and Yale in their final three games before the semester break. 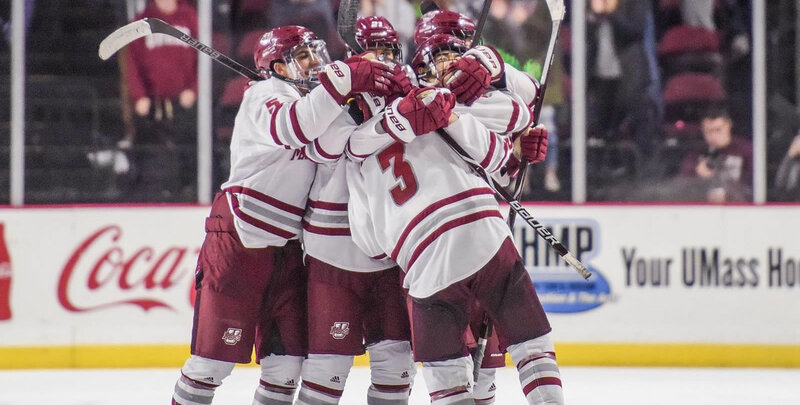 - UMass sits as the number one ranked team in the country for the first time in school history as the Minutemen prepare to take on #8 Quinnipiac and Yale in their final three games before the semester break. The #1 Minutemen have fared well in non-conference play through the first half, posting a 5-1-0 record in that span, losing only to then-#1 Ohio State, 3-1, on the road on Oct. 20. - Last season, Greg Carvel's team defeated Quinnipiac in each of their two meetings, but dropped a 5-3 decision in their only game against Yale. - Freshman Bobby Trivigno (Setauket, N.Y.) posted the third multi-point game of his career in UMass' most recent victory over UConn. The rookie opened the scoring just a minute and half in, before later capitalizing on a penalty shot opportunity in the third. He was named Pro Ambitions Rookie of the Week for his play. - Merrimack looks to snap a four-game winless streak as the Warriors take on #10 Providence and #13 Northeastern over the weekend. The Warriors posted an 0-4-2 record against the two programs in regular season play last year. - Merrimack recently dropped its first meeting of the season with the Huskies, 9-1, last Friday. Junior Patrick Kramer (Bridgewater, Mass.) had the lone goal of the game for the Warriors. - #10 Providence took a 1-0-1 mark in a home and home series with New Hampshire last weekend. The two teams played to a draw on Friday before the Friars took home a 3-1 victory on Saturday night. - Friars goaltender Hayden Hawkey (Parker, Colo.) had 45 saves on the weekend, allowing just two goals on 47 shots faced to backbone Providence to three points in the Army ROTC Hockey East Standings to keep pace with Northeastern in a tie for second place. - The #13 Huskies travel to Merrimack for their only game of the weekend to close out the first half of the season. They are currently riding a five-game win streak after downing the Warriors in their first meeting of the season, 9-1. - John Picking (Wellesley, Mass.) lead the offensive charge for Northeastern in that win, posting a career-high four points on two goals and two assists in the victory. The junior was named Hockey East Player of the Week for his play. - The Huskies and Eagles will play this weekend in the first two of three meetings over the course of the regular season. Last year, Boston College took the series, 2-1-0. - UConn looks to snap a five-game winless skid when the Huskies host the Eagles on Thursday night. Their most recent loss came at the hands of then-#3 UMass last Friday, 7-4. - Freshman Kale Howarth (Red Deer, Alta.) had two goals in the setback for UConn, marking the first two strikes of his collegiate career. - Jerry York's squad is carrying momentum after going 4-1-2 in their last seven, including last weekend that saw the Eagles take three out of four points from crosstown rival Boston University. The Eagles took game one at Agganis Arena, 4-1, before playing to the first 0-0 draw in series history on Saturday. - Joseph Woll (St. Louis, Mo.) stood tall between the Eagles' pipes, turning away 64 of 65 Terrier attempts on the weekend. He recorded 26 saves in Saturday's draw to earn his first shutout of the season and was named Hockey East Co-Defensive Player of the Week for his efforts. - The Terriers will look to turn things around when they take on the River Hawks in their last two Hockey East match ups before the break. Boston University has gone winless in its last three outings, including a 4-1 loss and 0-0 overtime draw with rival Boston College last weekend after dropping the title game of the Friendship Four in Belfast, Northern Ireland to Union over Thanksgiving weekend. - Jake Oettinger (Lakeville, Minn.) had 69 saves on 72 shots against the Eagles, including turning away all 42 shots he saw in Saturday's draw to help preserve the 0-0 tie. - UMass Lowell is back in action for its final games of the first half after enjoying a bye weekend. The River Hawks most recent game came in the form of a 5-2 victory over RPI on Nov. 25. - New Hampshire will close out the first half of the season this weekend when the Wildcats take on non-conference opponent Dartmouth in a home and home series. The two teams met once last season in the opening round of the Ledyard Classic, with the Big Green edging out the Wildcats, 3-1. - The Wildcats are coming off a weekend that saw them take one point from then-#10 Providence, tying game one, 1-1, before dropping game two, 3-1. Junior Mike Robinson (Bedford, N.H.) posted 62 saves on 66 shots in the two games. Up front, Liam Blackburn (Prince George, B.C.) extended his point streak to four games after dishing out an assist each game. - The Black Bears head to Plymouth, Michigan to take on USA Hockey's National Team Development Program in exhibition play before the start of the mid-season break. Maine is rolling off of a two-game, three-point road trip to Vermont that a pair of overtime games with the Catamounts. In game one, Ryan Smith (Roanoke, Virginia) snapped the stalemate to earn a 2-1 victory. Saturday's game ended in a 3-3 draw. - Sophomore Jeremy Swayman (Anchorage, Alaska) turned away 74 of 78 shots on the weekend to help Black Bears to three points in league action and earned Hockey East Co-Defensive Player of the Week honors in the process. With the three points, Maine is just one win out of a tie for fourth place in the Army ROTC Hockey East standings. - The Catamounts are back on the road after a two-game home stand as they head across the country to take on Colorado College in Colorado Springs. The two teams met at Gutterson Fieldhouse at the start of 2017-18, splitting the two-game series, 1-1-0. - Vermont has posted a 3-1-0 record through four non-conference games since the start of the year, including a season-opening at #4 Michigan. - Max Kaufman (Rochester, N.Y.) had his hand in each of the Catamounts goals in Saturday's draw. He dished out two helpers and added the game-tying goal with just under five minutes to go in the third period to force the extra frame and secure a point for Vermont.